A photo of one of Ann Arbor's new crosswalk ordinance success rate signs. Photo by Mary Morgan. 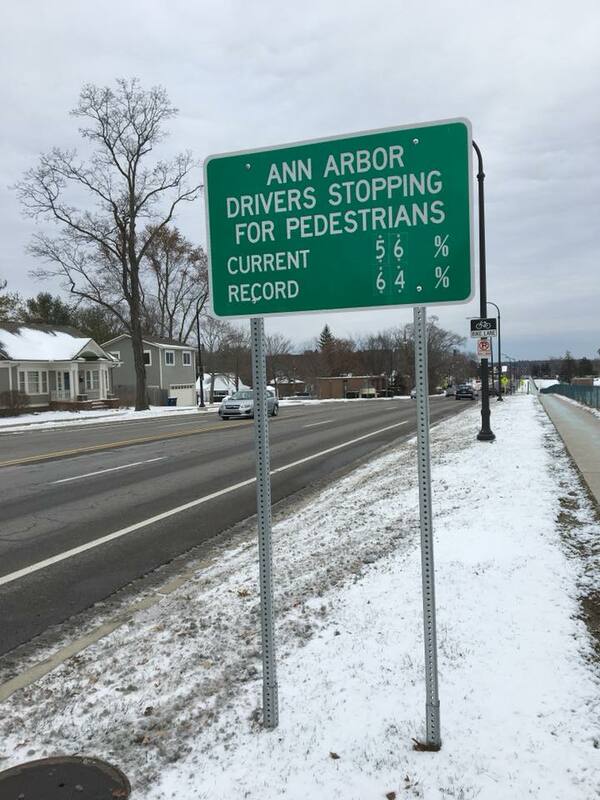 Dedicated readers of Damn Arbor will know we strongly support Ann Arbor's Crosswalk Ordinance. By way of background, here are just a few Crosswalk Ordinance articles from our archive: Much ado about crossing; Reflections on the Crosswalk Ordinance; Stay vigilant for coming attacks on the Crosswalk Ordinance; and, Mayor promises to veto repeal of crosswalk ordinance. Broadly speaking, Damn Arbor supports things that make it easier to be a pedestrian. We do however have two pieces of constructive criticism. First we'd like to see more HAWK Walks, especially for crosswalks on 4 lane roads. We know HAWK Walks cost more than RRFBs but we feel like the hawk walk signaling is clearer and more visible than RRFBs making for a safer crosswalk on busy roads. Second, we would like to see street signs at major entrances into Ann Arbor that explain the crosswalk ordinance. Something along the lines of: "local law: drivers must yield to pedestrians at marked crosswalks." This would help address the question of how to communicate the ordinance to drivers that don't live in the city. There are about 50,000 weekday commuters into Ann Arbor, plus visitors for special events like sports games and festivals. It is important that we communicate our crosswalk expectations to these drivers if we want them to comply with the ordinance. A2gov.org, Facebook (City and AAPD), Twitter (City and AAPD), MLive, CTN, WEMU, Posters, Bumper stickers, Keychains, Slap bracelets, Informational handouts, Resident Newsletter, Bus ads (on buses and at bus stops), Print ads, Radio ads. It is jaw dropping that the city has elected to use slap bracelets before street signs in attempting to inform people about Crosswalk Ordinance. I know slap bracelets are much cheaper than street signs, but they just don't seem to be like an effective way to communicate to motorists or pedestrians at scale. If Ann Arbor wants to increase the percentage of drivers who yield to pedestrians, the city needs to make sure as many drivers know about the Crosswalk Ordinance as possible. On an average weekday, 50,000 people commute into Ann Arbor. Most of these commuters are driving. There are also numerous people who visit Ann Arbor for the Hospital, the University, or various festivals. We cannot expect these people to comply with the Crosswalk Ordinance if they don't know what the Crosswalk Ordinance is. Clearly information about the Crosswalk Ordinance has not been spread as widely as possible. Ann Arbor needs to find a way to communicate its crosswalk expectations to people who don't read MLive and don't wear slap bracelets. The city should invest in street signs that explain our Crosswalk Ordinance at the major road entrances into Ann Arbor. Special thanks to CivCity's Mary Morgan for the picture above. I fully agree. In my vision these signs additionally communicate our shared value for peds and bikes so cars from out of town understand the culture. I envision something after the ord explanation like, "Thanks for driving gently! We value our peds and bikes--they are like family to us!" i.e., not just a small informational sign, but a larger one with an image of a cute kid on a bike with a mom walking aside that is indoctrinating and compelling. I fully support your idea of indoctrinating drivers with signage. I will respectfully disagree here. No matter how much signage is placed, it takes many repetitions to "break" a habit. Thousands of visitors will not have enough practice to make our unique (in the world) law stick. I'm in favor of rejoining the rest of the world to ensure the safety of walkers/cyclists/drivers. I respectfully disagree here as well. Having a traffic law that is unknown outside of this city is simply a dangerous law. I see WAY too many close calls with pedestrians assuming that drivers know the law. Public safety is way more important. Rather than save a life, this law is more likely to cost a life. Stop, look and listen at non signalled corners or crosswalks is the safest way for all. As someone who walks more than drives, I don't want to rely on a driver to watch out for me. I want to watch out for them. And if it takes an extra minute or two to cross, no big deal. Also, each time a car stops, and then has to resume driving, a lot of energy is wasted and a lot of air pollution and health problems are created. No negative consequences for pedestrians stopping. I choose to act ecologically and give cars the right of way when walking.